Protopsaltis John Michael Boyer has been performing since the age of 7, then the youngest ever member of the Portland Opera Association. 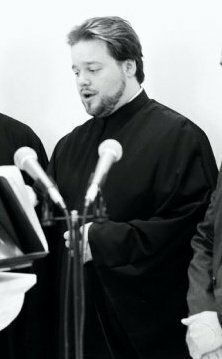 As a specialist in Byzantine chant repertoire, he lectures at workshops and seminars on Eastern Orthodox liturgical music across the United States. In addition, he coached the vocal ensemble Chanticleer in their Grammy-winning recording of John Tavener’s Byzantine-influenced Lamentations and Praises. Boyer has received critical acclaim for his solo chant performances with Cappella Romana. He began studies of Byzantine Chant at age 14 under musicologist Alexander Lingas at Holy Trinity Greek Orthodox Church in Portland. In 1996 and 1999, he furthered his studies in Greece under Lycourgos Angelopoulos, director of the Greek Byzantine Choir and Protopsaltis (first cantor) at Agia Irini (St. Irene) Church in Monastiraki, Athens. In 2000, Boyer lectured and sang at the Liturgical Singing Seminar in Santa Rosa. At the 2001 Western States Diocese Greek Orthodox Church Music Federation Conference, he directed the Byzantine Chant Schola in liturgical performances of his own transcriptions and English adaptations of the Byzantine melodic tradition. Under Boyer’s direction, these settings have been recorded and released on CD by the female vocal group Eikona. In 2002, he led the University of California Chamber Chorus in performances of his own transcriptions for the Berkeley Festival and Exhibition. In the 2003-04 academic year, he worked as research assistant to Dr. Lingas on a general historical survey of the Byzantine musical tradition at the Institute for Advanced Study in Princeton, and chanted as assistant to Protopsaltis Dr. Yioryos Bilalis in Jamaica, New York. Since then, he has returned to Athens to study advanced theory and orthography with renowned cantor and musicologist Ioannis Arvanitis, and to sing once again with Angelopoulos’ choir at Agia Irini. Boyer continues to produce original and adapted settings of chant in both Post-Byzantine and Western notations. He now serves as principal editor for Cappella Romana, composing, transcribing, adapting and compiling Byzantine music in the received tradition, including the scores for the critically acclaimed recording The Divine Liturgy in English, which presents the Divine Liturgy of St. John Chrysostom sung in Byzantine chant in the English language. Married to my wife Nino from the Republic of Georgia. We have a daughter Mariam, 10 years old. At that time I was training to be a Reader in the Serbian Orthodox Church in Fresno, CA. In 2010, we moved to Denver, CO. We decided to attend St Catherine Greek Orthodox Church in Green Wood Village, CO. I was tonsured a Reader this year on April 11, 2015 by Bishop Isiah. I pray that you are well. I need more Training in Byzantine Chant in English. What are the options for me. Is it possible to do a training at our Church someday? Please stay in touch. God Bless you.